Professor Chaturvedi has done his M.Sc. and Ph.D. from Banaras Hindu University in 1984. Later, from 1986-87, he did his post-doctoral research in the laboratory of Professor Charles Weissmann, at University of Zurich, Switzerland. He was a Visiting Scientist and subsequently served as a Visiting Professor at MD Anderson Cancer Center, University of Texas, Houston, USA. Since 1993, he has a long and continued research collaboration with MD Anderson Cancer Center. He has participated in more than 90 National and International conferences and chaired many Scientific sessions at International and National Conferences and Symposia. He has published 68 papers in peer-reviewed journals of high impact factor, and citation index of the papers published is more than 5000, and the H- index is 32. In the year 2011, Prof. Chaturvedi was elected as a Fellow of the National Academy of Sciences, Allahabad. Earlier to this in 1988, he was awarded Young Scientists Medal of Indian National Science Academy, New Delhi, in 1992, Diamond Jubilee Fellowship of the National Academy of Sciences, Allahabad. He has received Swiss National Science Foundation Fellowship in 1986, Asian Molecular Biology Organization Fellowship in 1990, Clayton Foundation Fellowship in 1993. He is also a recipient of BHU Gold Medal in 1978, AB Mishra Prize, RK Reddy Award, BHU in 1978, Tilak Award of Association of Gerontology (India) in 1984. In the year 2016, Prof. Chaturvedi has been elected as the President of Association of Teachers in Biological Sciences. 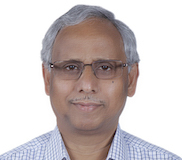 He has served as elected Vice‐President of Indian Society of Cell Biology (2009‐2011, Vice‐President, Indian Association of Teachers in Biological Sciences (2009‐16), Secretary of Association of Gerontology, India (1997-2002), Convener, Society of Biological Chemist (India) Varanasi Chapter (1999‐2003), Council Member of Indian Society of Cell Biology (2000‐02, 06‐08). In addition of this, he is an external member of Boards of Studies of many Universities in India, has played active role as member in various academic & administrative committees, in CSIR and UGC. 2006 Visiting Professor, The University of Texas, MD Anderson Cancer Center, USA. 1998 Visiting Scientist, Fellowship, The University of Texas, MD Anderson Cancer Center, USA. 1996 Visiting Scientist, The University of Texas, MD Anderson Cancer Center, USA. 1995 Man of the Year, American Biographical society, Raleigh, NC, USA. 1993 Clayton Foundation Fellowship, MD Anderson Cancer Center, University of Texas, Houston, USA. 1992 Diamond Jubilee Fellowship, The National Academy of Science, India. 1991 Asian Molecular Biology Organization Short term Fellowship, Tokyo, Japan. 1988 Indian National Science Academy Young Scientist Medal. 1984 ‘Tilak’ Award for best paper presentation in Association of Gerontology (India) Conference at Tirupati. 1978 Gold Medal and a certificate for standing First in M.Sc. (Zoology), BHU, Varanasi. 1978 Prof. A.B. Mishra Award for standing First in M.Sc. (Zoology), BHU, Varanasi. 1978 Shri R.K. Reddy Award for securing highest marks in Biochemistry Spl. Paper M.Sc. ( Zoology ), BHU, Varanasi. 1977 Certificate of Merit for standing First in M.Sc.(Prev.) Zoology, BHU, Varanasi. 2016 Elected, President of Indian Association of Teachers in Biological Sciences for the year 2016-onwards. 2014 External Member, School board, School of Life sciences, University of Hyderabad. 2013 External Member, School Board, School of Life Sciences, North Eastern Hill University, Shillong. 2012 Member, Editorial Board, Journal of Oncolytic Virology. 2011 Team –Leader, International Biology Olympiad held at Taipei City, Chinese Taipei in July 2011. 2010 Chairman, Technical Committee, Inst. of Cytology & Preventive Oncology (ICMR), NOIDA (UP), India. 2009 External Member, Board of studies of Indian Institute of Science Education & Research (IISER), Bhopal. 2009 Elected, Vice-president of Indian Association of Teachers in Biological Sciences for the year 2009-16. 2011 Team –Leader, International Biology Olympiad held at Tsukuba City, Japan in July 2009. 2008 External member of Special Committee, School of Life Science, Jawaharlal Nehru University, New Delhi, 2008-11. 2007 Member, National Academic Committee, IBO 2008, Homi Bhabha Center for Science Education, TIFR, Mumbai. 2006-09 Member for Academic Council, Jawaharlal Nehru University, New Delhi. 2007-09 Member, Board of Studies, Dept. of Molecular & Human Genetics, Banaras Hindu University, Varanasi. 2005-08 Member, Technical Committee, ICMR Institute of Cytology and Preventive Oncology, Noida (UP). 2006-08 Member, Technical Committee, National Institute of Biologicals, (Ministry of Health & Family Welfare), Noida (UP). 2004-07 Member, Board of Studies, Department of Zoology, North Eastern Hill University, Shillong (Meghalaya). 2004-05 Member, Board of Studies, Dept. of Genetics, Barkatulla University of Bhopal (MP). 2003-04 External Member, Board of Studies, Dept. of Biochemistry, HNB University, Gharwal (Uttaranchal). 2003 Member, Expert Committee for revision of syllabus of National Eligibility Test (NET) conducted by Council of Scientific and Industrial Research, New Delhi, India. 2002-03 & 05-09 Elected Council Member of Indian Society of Cell Biology. 1996-2000 Elected as Secretary of Association of Gerontology ( India ). 1999-2003 Elected as Convener of Society of Biological Chemists (India), Varanasi Chapter. 1993-1996 Elected as Treasurer of Association of Gerontology ( India ). Chaired many Scientific sessions at International and National Conferences and Symposia.